Today ONLY (10/2), Smokeless Infrared Grill $134.99 (Retail $179.99). SMOKE-LESS TECHNOLOGY - Tenergy's indoor infrared grill creates 80% less smoke than other indoor electrical grills. The infrared heat is only directed at the grill rack's surface and the cooling tray catches grease and oils before they get the chance to become smoke. ADVANCED INFRARED HEATING TECHNOLOGY - Our electric barbecue grill evenly cooks meats, fish, poultry and vegetables using advanced infrared heating technology. With the unique infrared heating technology, heat is evenly spread on the grill top. Food is guaranteed to cook evenly, no cold zones or weak spots. EASY TO USE AND CLEAN – Two-piece setup home grill takes less than a minute to start grilling. Just put the grill rack on top, slide in the drip tray, and plug in the power and the grill is ready. Clean up is just as simple and stress free thanks to the non-stick grill and dishwasher safe parts. GRILL LIKE A PROFESSIONAL - Quickly heats up to an ideal grilling temperature of 446°F within 6 minutes. Enjoy searing meats and vegetables with steakhouse like quality diamond grill marks. 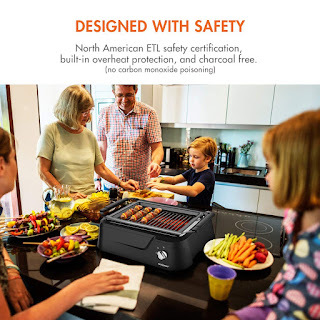 DESIGNED WITH SAFETY - Tenergy's infrared grill is certified safe by North American ETL standards. This home grill also comes with built-in overheat protection, automatically shutting off if the internal temperature gets too high. Receive up to two years extended warranty support when you register your smoke-less grill with Tenergy Life.